Ptilotus exaltatus growing herbaceous of the genus Ptilotus also known as Pink mulla mulla, Ptilotus exaltatus short perennial or annual used as ornamental plant also drought tolerant, can grow in mediterranean, desert, subtropical, temperate or tropic climate and growing in hardiness zone 10b+ as perennial and 2-9 as annual. Leaves color green the leaf shape elliptic the leaf fleshy. Flowers are small growing in groups on inflorescence stalk in a shape of cone, flower color pink to purple. 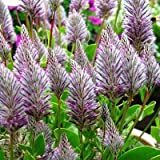 Small flowers grows in groups on inflorescence stalk in a shape of cone, flower color pink to purple.